This edited article about motor cars originally appeared in Look and Learn issue number 655 published on 3 August 1974. What makes the “Black Bess” different from all the other Bugattis? It was the only Bugatti to be built with a chain drive. Known as the “Black Bess,” the 5-litre, 1913 model was bought by the famous French aviation pioneer and First World War flying ace Roland Gavros. Ettore Bugatti, the car’s designer and builder, was born in Milan, Italy, in 1881, the son of a well-known goldsmith, who wanted his two sons to become artists. One of them, Rembrandt Bugatti, was to become well known as a sculptor. But Ettore loved mechanical things. At the age of 17, he planned and built his own two-engine tricycle. After a year as an apprentice with an engineering company, Bugatti built his first motor vehicle, the forerunner of a line that was to continue for 40 years. Bugatti established his own factory in 1910 at Molsheim in Alsace. At 28, he was a famed car designer, his talents being used by De Dietrich and Peugeot. His first production car, Tipo 13, was meant for racing. At about the same time, he produced a road car which was bought by Peugeot and named the Bebe. 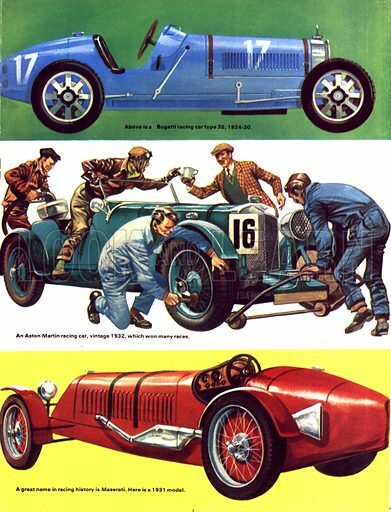 Now started a period, ending with the outbreak of the First World War, when from the lively mind of Bugatti came many marvellous machines which were the stars and victors of over a thousand races. The victories were due to the exceptional stability of these cars and the careful design of the engines. Their famous horse-shoe radiators became the hallmark of success. Ettore Bugatti died in 1947. The Bugatti car company carried on for some years after his death, but the cars built without the genius of the man who created the line were not true Bugattis, as any enthusiast will agree.